Martin, a Dallas native, was chosen by the Cowboys in the third round of the 1973 NFL draft and, while there were early concerns regarding a lack of aggressiveness, he quickly established himself as an outstanding pass rusher with outstanding speed and technique. By 1976, he was named to the Pro Bowl for the first time and also received second-team All-NFL honors from the Associated Press and second-team All-NFC recognition from UPI. Cowboys went 12-2 to finish first in the NFC East with the conference’s best record while leading the NFL in fewest yards allowed (3213) and the NFC in sacks (53) and fewest rushing yards allowed (1651). Won NFC Divisional playoff over Chicago Bears (37-7), NFC Championship over Minnesota Vikings (23-6), and Super Bowl over Denver Broncos (27-10; Martin and DT Randy White were co-MVPs). Martin followed up with two more Pro Bowl seasons in 1978 and ’79, despite playing through injuries. He was especially effective in combination with DT Randy White, as both required double-teaming, and was unofficially credited with 16 sacks in ’78, tying for the team lead with White. 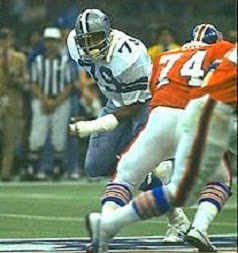 Martin ended up playing 11 years for the Cowboys, abruptly retiring after the 1983 season. A popular figure in Dallas, where he had a radio show and business ventures, he was dogged at the end by off-field problems. Overall, he left as the team’s career leader in sacks (which didn’t become an official statistic until his last two seasons) with an unofficial total of 113 over the course of 158 games (officially, he had ten in 1982 and ’83) and also appeared in 22 postseason games. Martin received consensus All-NFL honors once, second-team recognition after three other seasons, and was chosen for the Pro Bowl four times.